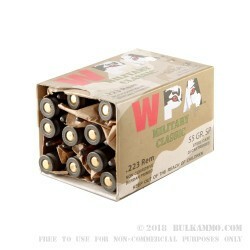 A case of 500 .223 Remington rounds of the very reliable and value priced WPA Military Classic offering from Wolf. This is a steel cased soft point projectile cartridge that has famously risen to prominence in the wake of ammunition cost increases, as the overall cost to shoot these rounds has historically been very low. 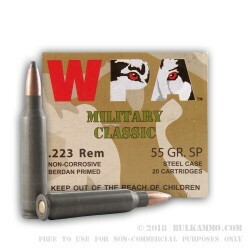 The cost per round is an obvious enticement to buy these steel cased cartridges. 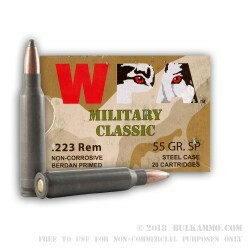 The 55 grain soft point projectile in this .223 Remington load offers a suitable bullet for many types of game ranging from varmints and ultra-small game up into the moderately sized game categories to include intermediate sized deer. Make sure that you can use a lead-based round with a .223 Remington caliber in your area before you attempt to hunt bigger game with this round. The laws can vary heavily from state to state and area to area. The steel casing is non-reloadable (it can be reloaded but it is much harder than more traditional loads, and is not cost effective) and while it isn’t the perfect round for match grade guns because of the tight tolerances, it functions beautifully in just about any mainstream firearm. 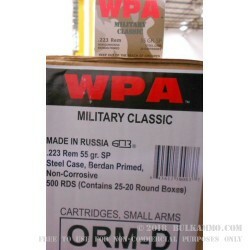 WPA ammo is good stuff!